#1. 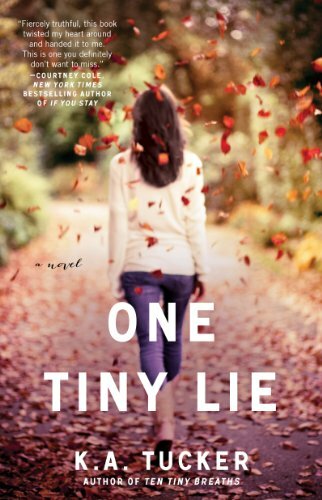 Before the Ten Tiny Breaths series was picked up by Atria Books, I had a cover created for One Tiny Lie. I won’t post it because I can use it for another book, down the road. What I will say is that the concept is COMPLETELY different from the released (Atria) version. #3. Originally, Livie was going to live with three girls instead of just one, and there was going to be a whole nightmarish roommate sub-plot worked in. It would have been highly entertaining. But, I killed that idea. It was just too complicated, with everything else going on in OTL. I think Reagan comes with enough drama, anyway. #4. I absolutely despise tequila. I can’t even handle the smell of it. Years ago, when I used to bartend, I’d gag as I poured shots for customers. It’s the most disgusting liquor created by mankind, in my opinion. I’d rather drink gasoline. And yet, I make all of my characters drink it. LOL! This was fantastic. I love the sense of camaraderie, friendship and family when it comes to these characters, and well… that’s just hilarious that she makes them all drink her most-hated liquor.